Most of us expected that after Hurricane Sandy raging on the Eastern Seaboard, The Google launch event will be postponed. Even in the tough time Google managed to do the revelation ceremony of their new Nexus Tablet very efficiently and beautifully. 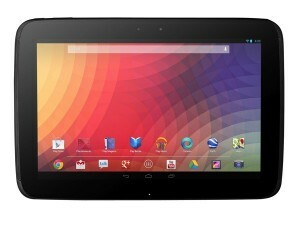 They have launched the new Google Nexus 10 Tablet with Android 4.2 Jelly Bean. Its a look alike Galaxy Tab 10.1 as its made by Samsung. Nexus 7 the previos Google Tablet featured a Quad core processor but this time they have included Nexus 10 with a 1.7Ghz clocked Cortex A15 processor on Samsung Exynos 5250 Chipset paired with the new Mali T604 graphics. This is quite disappointing at the first look, but you will be astonished by other features. Samsung and Google brings the highest resolution screen on a Tablet and the new Nexus 10 features a multi-touch capacitive 10 inch touch-screen with 2560 X 1600 display[Full HD] and that too with 300 ppi density. As like Nexus 7 there is a Corning Gorilla Glass protection. Samsung has created a whole new 9000mAh battery power house for this Tablet that makes it run 10 hours while using Internet through Wi-Fi or 8 hours of video watching. You will be experiencing a great quality. Google has thought deeply about the features and they realized that front placed speakers are better than the back ones and so the new Nexus 10 and speakers build at the front. “What will a HD screen Tablet do without an HD Camera?”, so there is a 5MP Camera on the back that can record video at 1080p@30fps. There is a 1.9 MP camera for video calling. 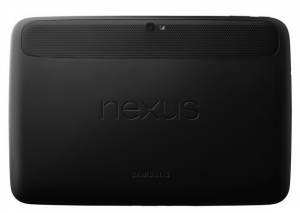 Nexus 10 will be shipping in 2 variants – one with 16GB storage and another with 32GB. It seems like Google has included connectivity features like Bluetooth v4, Wi-F-, Wi-FI Direct, MicroHDMI, MicroUSB and NFC. You will be missing 3G or 4G connectivity. Nexus 10 has been launched after a long market research and success of Nexus 7. Google and Samsung decided to keep their margin low to beat iPad, the 16GB edition is priced at $399 and 32GB variant will be available at $499. Nexus 10 will be available through Google Play Store after 13th November, US, Australia, Japan and Europe [UK, France, Germany, Spain] based customers will be able to purchase it online.